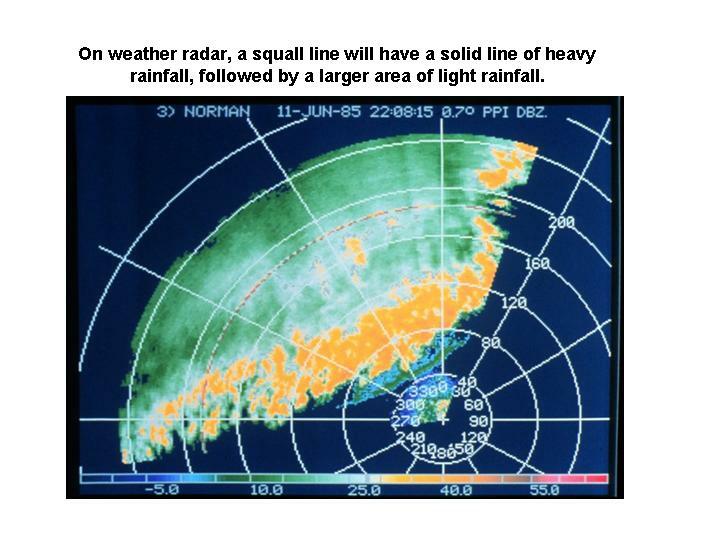 A squall line is a system of thunderstorms that have formed into a line. This often occurs ahead of a cold front, where wind shear combined with unusually widespread lifting of the lower atmosphere causes convection to become arranged in a banded structure. The line itself will be relatively narrow, and it is usually followed by a much larger area of ligh rain trailing behind it. While a squall line can have heavy rain, high winds, and small hail, tornadoes and large hail are more commonly associated with isolated thunderstorms, not squall lines.